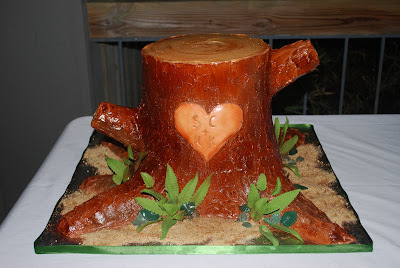 Well another stump cake already! The location for the reception was the Chattanooga Nature Center. I got to see a baby bunny and a chipmunk in the short time I was there. I just love animals! Anyway about the cake, I am finding these pretty easy to do which is nice for a change. This bride wanted the limbs coming out of the trunk so I used rice krispie treats and put a couple wooden skewers in each. The roots are also krispie treats. I used a 12″/11″/10″ and 3 9″ rounds. There was a cake board under the 3 9″ so I could dowel under it. I use a french buttercream and when I add chocolate you can’t get too much or it will become runny so it’s necessary to airbrush to get the darker bark color. I used black and brown (last time I used yellow also, but like it better this way) After it was moved a couple of times it made a “crack” where the top 3 layers met the bottom 3 layers. I hate that! It’s easy enough to fix except when you have airbrushed. I was able to totally repair it but because I was worried it would happen again in transport, I brought my entire airbrush set up just in case I had to fix it again. For the top, I airbrushed the circles and then went back with my icing spatula and smoothed it again. It made them not as harsh. The fern leafs were gumpaste, leave were fondant. Oh, the heart was fondant that I carved deeply so that when I pushed it in the dark brown icing behind it came through a little. I pushed it in so that it was flush with the icing. It would have looked bad to just sit on top of the icing. Wouldn’t have looked realistic at all. The bride was happy and the Nature Center said they were going to use it in the wedding brochure. GO ME!